My second Front Row Agile post has just been published which is great to see. This is the first post in a series of four on the role of a product owner. This post examines the responsibilities of the role and the characteristics of an ideal product owner. I attended the one-day Agile Tour London 2016 conference on the 21st October and thought I would write a few words on the event. Agile events are always entertaining with a range of presentations and workshops from a varied set of industries, methodologies and people. I recommend Agile Tour London as a great opportunity for collaboration and sharing of experience to learn from others on the same journey. I always look forward to attending Agile Tour London as each year I get to spend the day with two great people who I used to work alongside. As well as listening to presentations and taking part in workshops we have the opportunity to talk over lunch about the industry, our roles and the changes happening. We also compare notes on the sessions we attend and share information and techniques. The program was full this year offering five different choices for each of the six forty-five minute sessions. To challenge myself this year I avoided all of the presentations and opted instead to perform three double-session workshops. My reasoning was that I would gain most from the day in this way and would end up with the most useful and actionable outputs. ATL2016 started with development coach Antony Marcano’s keynote “Don’t put me in a box”. Antony spoke about avoiding using job titles as labels for people and that limiting people by their perceived role is a massive waste. The keynote was slightly rambling and fairly interesting but certainly not an empowering ground-breaking call to action which I may personally have hoped for. 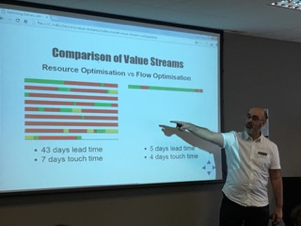 The content was based on some of my favourite books including Principles of Product Development Flow, The Phoenix Project, Slack, The Toyota Way, Value Stream Mapping and Specification by Example. In this workshop our challenge was to build the puzzle in 15 seconds (step 1). Our team’s first attempt at putting the puzzle together took 45 seconds (step 2). Our target for the next condition was 40 seconds (step 3) with our experiment being to split the puzzle areas among the team (step 4). We achieved 38 seconds so considered the first experiment a success. We then iterated through a series of experiments to continue improving upon our time. 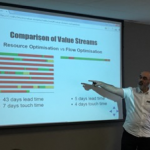 The workshop was based on another couple of great books – Toyota Kata and Managing Flow. The last workshop of the day was “Lean Startu p game” with Frederik Vannieuwenhuyse where we used the board game Playing Lean to learn more about innovation and Lean Startup. I love using the Playing Lean game for training Lean Startup and was keen to see someone else teaching to see what I could learn. Our team of three competed with three other teams to develop an idea into a market winning product. It was great fun to see our company develop and product evolve over the ninety minutes until we achieved market fit and won the game. Frederik clearly demonstrated the Lean Startup principles via the Playing Lean board game and I felt everyone left with a better understanding. As a hint, try to avoid the grumpy cat experiment card – very annoying. Playing Lean is based on the books Lean Startup, Running Lean and The Startup Owners Manual. After three intensive workshops I enjoyed networking during the farewell drinks. I look forward to seeing many of you at next year’s conference.